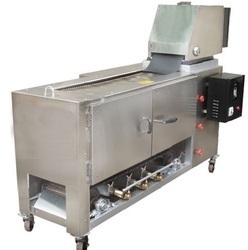 Offering you a complete choice of products which include fully automatic layer type chapati making machine, layer type chapati making machine, automatic chapati making machine with rotary puffer, chapati machine with straight burner puffer, commercial semi cooking chapati pressing machine and compact chapati making machine. The Automatic Chapati making machine is a advanced and new generation of chapatti making work and has limited the dependence on labor completely. The machine is completely made of stainless steel 304 and hence ensures complete hygiene and safety to consumer. 1) The entire system is designed to ensure guaranteed satisfaction to the consumer along with 100% accountability of Standardized Mass Production. 2) The machine's simple design and user friendly interface makes it very easy to operate. An Ordinary Labor can operate this machine with minimal training. 4) The automation in the machine is at high level ensuring regulating temperature and gas consumption. 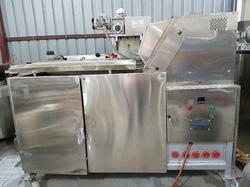 6) The machine may be available with automatic oil spray and standard chapatti counter and process timer, gasconsumption meter, multiple cylinder regulator, and automatic dough making system on demand. Currently these feature are not covered under scope. Chapatti Size 4.5" - 7"
Chapati Size 6" - 8"
Chapati Size : 6" - 8"
L.P.G. Pressure: 5 p.s.i. to 7 p.s.i. We are successfully meeting the varied requirements of our clients by providing the best quality range of Automatic Chapati Press Machine. L.P.G. Pressure 5 p.s.i. to 7 p.s.i. Chapati Size 4.5" - 9"
We are offering Compact Chapati Making Machine to our client. 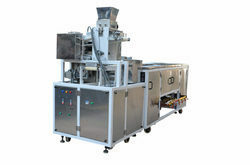 We are offering Nano Semi Automatic Chapati Making Machine to our client. 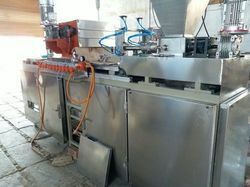 We are offering Semi Automatic Chapati Making Machine to our client. 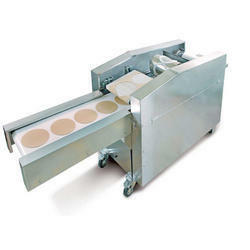 Chapati Size 4.5" - 8"
Automatic Chapati Making Machine has automated the process of peda making with chapati making. The Peda Making part produces Uniformly Rolled Sized Pedas which are then placed on Chapati Machine for pressing and baking. The produce is Soft, Puffed, Home like Chapatis. The machine has following advantages over the traditional machine available in market. The entire system is designed to ensure guaranteed satisfaction to the consumer along with 100% accountability of Standardized Mass Production. The machine's simple design and user friendly interface makes it very easy to operate. An Ordinary Labor can operate this machine with minimal training. The automation in the machine is at high level ensuring regulating temperature and gas consumption. L.P.G. Consumption 2.5 to 3.0 kg/ Hr Chapati Size 4.5" - 8"
Diameter Of Chapatti 4.5" - 8"
The produce is Soft, Puffed, Home like Chapatis. The machine has following advantages over the traditional machine available in market. 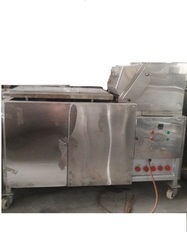 We are offering Semi Automatic Chapati Making Machine for Canteens, Temples, Ashrams, Marriage. The Chapati making machine is a advanced and new generation of chapatti making work and has limited the dependence on labor completely. 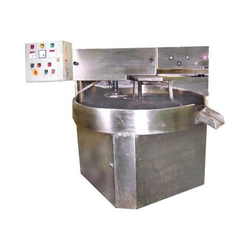 The machine is completely made of stainless steel 304 and hence ensures complete hygiene and safety to consumer. L.P.G. Pressure (psi) 5 p.s.i. to 7 p.s.i. Chapatti Size (inch) 4.5" - 9"
Diameter Of Chapatti 4.5" - 9"
L.P.G. Pressure L.P.G . Pressure 5 p.s.i. to 7 p.s.i. 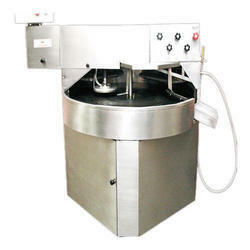 We are offering Semi Automatic Round Type Chapati Making Machine. 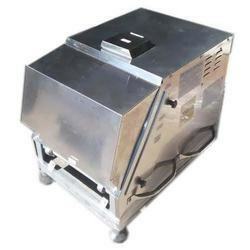 We offer chapati machine for corporate offices, university campus, ashrams, canteens, messes. Chapati Size 7-8", 4-5", 6-7", 5-6"
LPG Pressure 5 p.s.i. to 7 p.s.i. We are offering Jowar Roti Making Machine to our client. We are successfully meeting the varied requirements of our clients by providing the best quality range of Semi Automatic Chapati Pressing Machine. 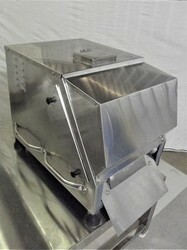 Looking for Chapati Making Machine ?